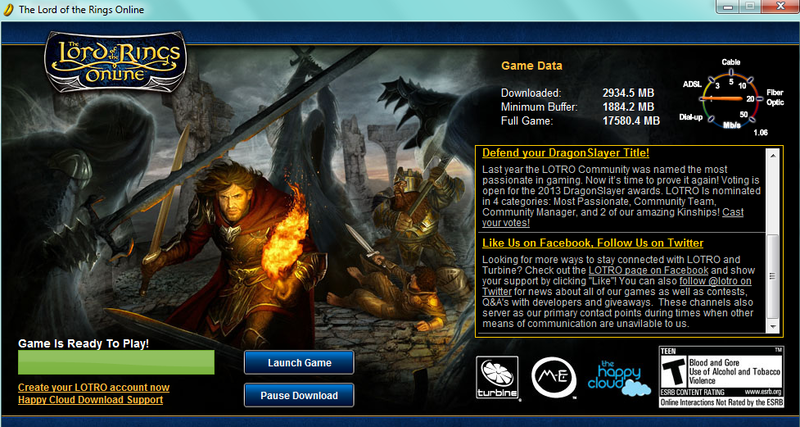 Lord of the Rings Online’s progressive download!! Today, I jumped on the Lord of the Rings Online (LOTRO) bandwagon. I wanted to try it before, but the size of the download is really intimidating. Recently I signed up for a Coursera course about Online Games, the teachers seemed liked rather big fans of the game and I felt like I might get more out of the course if I played. There are two tracks in the course as you will see. I wish to be part of the crowd that plays, maybe all of us students can form kinship as I don’t have one yet. I’m still in the introduction part of the game, and this is for me the one big interesting factor: the progressive downloading. After looking around in forums, once I was past my amazement when I stumbled upon the start screen after just a little while, I found that there are 3 stages to the download, and the first stage is only after roughly 250mb!! That is for the very short tutorial. And other stages are at other points (Introduction and full respectively). So basically, after the download reaches a certain stage you are allowed to play that portion while the rest of the game downloads! It’s pretty nice I think, instead of just sitting around waiting for the darn thing to finish you can jump right in and learn the ropes. I know it’s probably old news for a lot of people, but I was never much an MMO fan, mostly because the best time for ME to find adequate bandwidth is in the middle of the night. Next Post … Now you don’t!